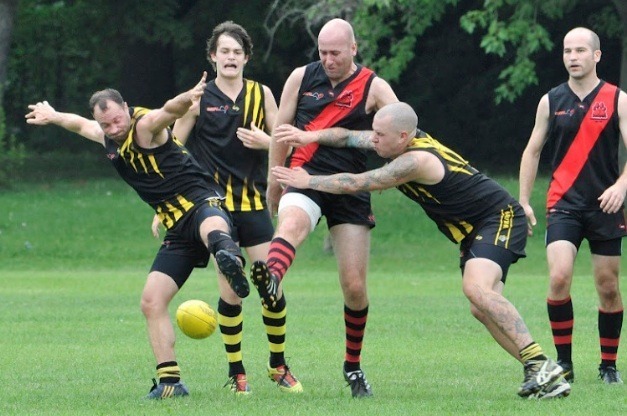 The Toronto Dingos travelled down the QEW for their annual clash against the Hamilton Wildcats on Saturday. Looking to bounce back from the previous week, the Dingos brought a strong side into the match, despite having many regulars out due to injures and family commitments. The Wildcats won the toss and elected to take the wind in the first quarter. The match started with both sides attacking the football with intensity. In the ruck, rookie Lynden Evers got the start for the Dingos and did well against his experienced counterpart, with legendary Dingos’ ruckman Chris Cunning watching from the sideline. Using the strong wind to their advantage, the Wildcats pressured the Dingos’ defence, but the fullback line of Tim Indian and Mike Bocian held strong and repelled numerous attacks. At the first break, the Dingos found themselves down by 15 points. The second quarter proved important as the Dingos finally had the wind at their backs. Dan Gunn was seemingly everywhere as he ran and created off the half-back line. Stephen Donnelly, relieved to be back in Canada, also stamped his authority on the match taking numerous marks. Up forward, Robert ‘Noddy’ McNaughton was given more opportunities to impact the match, and as always, he did not disappoint. Outnumbered often as the Wildcats keyed on him as a scoring threat, Noddy kicked a candidate for goal of the year as he outmuscled three Hamilton defenders to snap a beautiful goal. Elsewhere in the forwards Ben Moller laid bone-bruising tackles while Paul Tinkler provided a handy tall target. For the term, the two sides broke even, leaving the Dingos still down after the main break. In the third quarter, with the wind going Hamilton’s way again, the Dingos knew they would have to fight tooth and nail to the keep the game in reach. Dingo midfielders Steven Speers and Geoff Hansen fought valiantly all day, laying crushing tackles and putting their bodies on the line to get first use for the team. Back in his usual ruck position, Everett Wells did well to ensure the Dingo midfielders got equal delivery while Pat Bossey showed his fitness and ran all day in the guts. However, using the wind to their advantage, the Wildcats took a 5-goal lead into the fourth. Heading into the fourth quarter, the Dingos were confident they could peg back some of the points they lost in the third and have a run at the Wildcats. Throwing caution to the wind, the Dingos attack was relentless led by centre-half forward Sean O’Reilly. A force all day, the Irishman kicked an unbelievable goal from what is often known as a ‘dead pocket’ on the oddly shaped Hamilton ground. The pressure continued as the Dingos peppered the Hamilton backline, slowly erasing the Wildcats lead. However, the Wildcats snuck a late goal and were able to survive the final push from the Dingos, taking the match by eleven points. Final score – Hamilton 66 to Dingos 55. Close matches always hurt when on the losing end, but the Dingos can old their heads high after a strong performance on the road. Next up, the Dingos take on the Toronto Eagles at their usual ground at Humber South College. Our downtown sponsor since the 2015 season, The Office Pub - located in downtown Toronto at 117 John Street - has 3 patios, full food/drink menu with a great atmosphere to watch sport, partake in some karaoke or take the better half for a glass of wine. The Office Pub is the home for the Red & Black for post-match celebrations every Saturday night during the season, as well as special events including the Australia Day Party and the Dingos' legendary Grand Final Party. Scallywags are the Dingos' midtown pub and post training refreshment specialists as well as your destination for the BEST international sports coverage, fantastic selection of beers and delicious food served all day and night. Scallywags are also home to Midtown's fabulous, Year-Round Patio which has been recently expanded for your enjoyment. The Dingos' will be at Scallywags Thursday evenings after training and to catch special events including the games of the Toronto Wolfpack who also call Scallywags their midtown home. A proud supporter of the Toronto Dingos since 2008, the fine folks at Downunder Travel specialize in travel arrangements to Australia, New Zealand, South Pacific, Asia, and Africa. If you are travelling to any of these locations, please contact the helpful staff at Downunder Travel for the best price around. Just mention you're from the Dingos!